Registration is now closed. If you post to this thread however you will be contacted for next year's tournament. 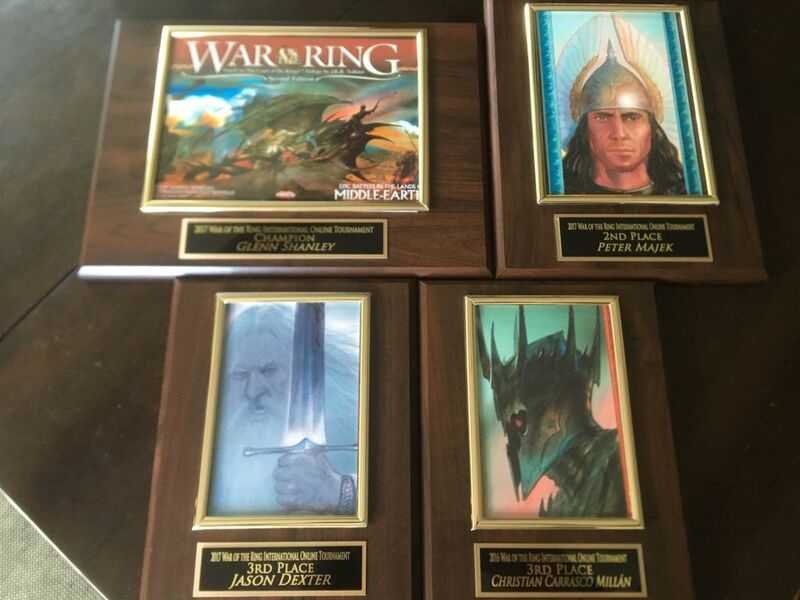 Greetings gamers, it is time for our annual War of the Ring (WotR) International Online Tournament. This year we are starting early and fully relying on the 2017 ladder standings for seeding of players. This would be the 10th annual online tournament (I can't believe how much time has passed). Veterans and rookies are welcomed, I hope you will participate! 2. Do you prefer a Swiss system or a pod/grouping format to select the semifinalists? Swiss is multiple scheduled rounds against different opponents every two weeks; pods would be groups of players that play each other within their group with the best 1-2 players advancing. The amount of time each pod would have to complete their matches would depend on how many players are in the match but would be a few weeks. I expect the tournament to start in about two weeks. I will email everyone who signs below. I recommend you have your BGG emails forwarded to your personal email address. If you do not communicate with your opponent three days after pairings are posted I will drop you from the tournament. Also if your match goes past three weeks we (volunteer judges and or myself) may be forced to arbitrate a winner. Weight will be given to whomever has been more available to play in addition to match standings and current game board position. Clearly gaming is not more important than other things in your life but in fairness to everyone else I will keep the tournament moving forward despite personal difficulties some of us may suffer. Thank you for your interest in participating and good luck! I am in. I will vote long and pod. Looking forward to another fun tourney! I'm in. Long and pod. I'm in. Don't mind any of the options. Edit: short and Swiss sounds like a cheesy “I like my women like I like my tournament” joke. I would like to parcipitate, I have no preference to tournament settings. Length: However many rounds are needed to determine a single undefeated player (probably 6). I'm in, long and pod. Magic Geek wants in. No pref. I would like to participate! I vote long and Swiss. I vote short and swiss. I'm sitting this one out. Have fun, and maybe I'll be available for those wanting to practice one side or the other. I`m in. I vote for Swiss and long. I'll give it a pass this year, guys. Have fun! I also want to sign up for the tournament and I would prefer Swiss and short.